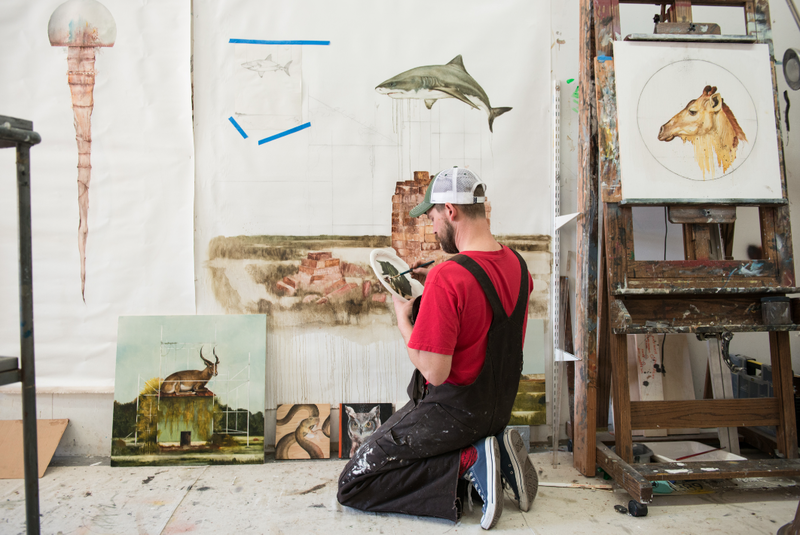 When organisms, animals and humans are all coexisting, when creatures are silently enjoying the mystery of life, San Francisco-based painter Kevin Earl-Taylor has been at work. His oil paintings are filled with symbols and explore death, life and survival. His fascination with animals, environment and human relations seems endless and has led him turn animals into humans in an anthropomorphic figure. It all makes us aware of other beings on the planet. Kevin Earl-Taylor is a painter who obviously cares about his environment, who visualises collective consciousness in his works - and that is what makes the artist so interesting to IWISHUSUN. We are very happy to welcome him as a friend! Sight. Because that’s just the way I see it. To inspire myself and others to ponder themselves and their surroundings. Animals play an important role in your work. What makes them so interesting? The diversity amongst them; their ability to adapt to changing conditions. The fashion in which they respect their environment and conduct themselves in manners we have “evolved” beyond. Mainly, because we humans are just as much animals but have chosen to exile ourselves from nature. That makes animals incredibly interesting. It’s like looking at ourselves in a broken mirror. At the same time your paintings bring together organisms, animals and humans and they all exist together. Is that your dream for the real world? It isn’t so much a specific dream, but I guess I do like the sense of harmony amongst a diverse cast of earthlings. What is your utmost concern in art? To always push one step further, follow my instinct and welcome the opportunity to fail. You live in San Francisco, a city of sun and fog at the same time. What impact do the city, the environment and the people have on your artistic work? Just like the city itself, it’s always in flux. From the crazies on the street to my best friends, they’ve all got a lot to offer a mind hungry for ideas. Being predictable is something this mixed up city knows little about. I’d like my work to be like that. My wife Jennifer and I adopted Ginger, a Chihuahua who needed a home. People being considerate of others. Depends on which one I’m at.